Most people (70-80%) infected with West Nile virus (WNV) will not have any symptoms. Some people will experience febrile illness while only a very small number (1%) develop severe neuroinvasive symptoms. Neoroinvaseive symptoms and human death from WNV have occurred within the District. There is no vaccine or cure for WNV in humans. There is a vaccine available for horses, which are highly susceptible to this disease. Approximately 1/3 of unvaccinated horses that contract WNV will die outright or have to be euthanized. 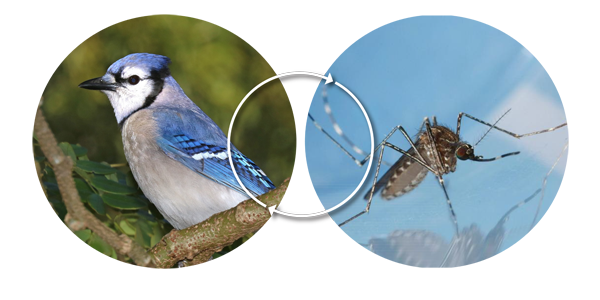 In nature, the West Nile Virus cycles between corvid and mosquito. Magpies, crows, ravens and jays are all local members of the corvid family, which are highly susceptible to West Nile virus infection. Testing of dead corvids has historically been an effective method for early detection of West Nile virus. West Nile virus was first detected in the western hemisphere in New York in 1998. It was first detected in the Shasta Mosquito and Vector Control District in 2004, and has been detected here every year since then so far.